The "Big Day" is just around the corner and I'm excited to share with you this easy recipe; perfect for a game day get together. Football games are notorious for unhealthy food snacking which is why I like to serve my guests sandwiches that will fill them and keep them from mindlessly munching on junk food while cheering on their favorite team. Roast Pork Italiano is a sandwich I grew up eating in South Philadelphia, and one that is a real crowd-pleaser. The meat can easily be made ahead and heated up on game day. Heat oven to 450°. Combine fennel, rosemary, parsley, thyme, garlic and crushed red pepper in a small bowl; set aside. Open pork shoulder and spread with half of herb mixture. Season with salt, and pepper. Roll up pork and tie with kitchen twine at 1inch intervals. Season out-side with remaining herb mixture and salt & pepper. Transfer to a roasting pan and roast until browned, about 40 minutes. Remove pan from oven, add stock, wine, onion, bay leaf and paste. Reduce oven temperature to 325°and cover roasting pan with aluminum foil. Cook until internal temperature of pork reaches 165°, about 2 hours. Set aside to cool. Transfer pork to cutting board. Remove bay leaf and strain juice into a saucepan. Slice pork into large pieces and add to juice to reheat. Bring a large pot of salted water to a boil, and add broccoli rabe. Cook, stirring, until just tender, 2–3 minutes. Drain, and dry thoroughly with paper towels. Heat oil in a large skillet. Add garlic and cook until translucent. Add broccoli rabe and crushed red pepper, stirring, until crisp and warmed through, about 4 minutes. Set aside. Place provolone on bottom half of each roll, and top with pork and some juice. Add broccoli rabe and serve. That is a great big delicious sandwich and perfect for game day!! Ohhhh Now this looks YUMMY!!!!!!!! I want a bite of that!!!!!! This sounds like my kind of sandwich! Yum - and I love broccoli rabe too! Love this sandwich! I would rather eat pork more than anything else! I'd love that delicious sandwich any day of the year!! What a scrumptious sandwich! I am ready to eat it off the screen! Pinned and Yummed! That's a good looking sandwich! I would MUCH rather have your sandwich than junk food! 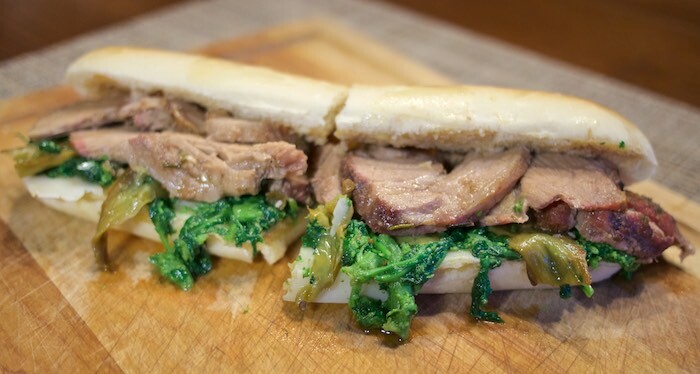 Broccoli rabe is a favorite veggie how nice to see it in this tasty sandwich! Broccoli Rabe was a wonderful addition to this sandwich! This is a great idea for a sandwich! Mmm!Looking to see who has pork on sale this week! Fabulous looking sandwich and no doubt delicious! I would love this sandwich today, or any day! Great job with this one! Now Thats Great Game day food! My football fans would line up around the block(at half time ) for these delicious sandwiches! These sound so good, I'd definitely enjoy chomping down on one of those! Oh goodness this sounds so lovely! Yes please! This sandwich looks great! Perfect for game day! Ooh, i want to take a big ol' bite of that, yum! Where can I place my order please? One for my office lunch please! This sandwich definitely looks like a crowd pleaser! Yummy! This sandwich looks delicious! I love pork on sandwiches...yum! This is my kind of sandwich! Love pork & broccoli rabe together!!! Holy Moly that looks incredible! If I had a sandwich like that to eat I would care less about the game. This looks delish! It would be great cut up and served as an appetizer for a party too! Such a great looking sandwich! That pork looks amazing. Mouthwatering! I love a juicy roast pork sandwich!